The reconstruction of the streets will consist of complete removal and replacement of the street section and the curb and gutter. 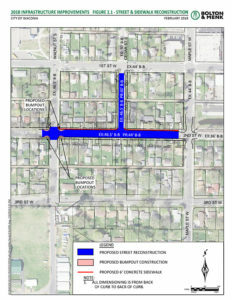 New streets will be constructed in the blue areas shown below. Second Street will be 44 feet wide with a sidewalk on the north side (shown in red). Cedar Street will be 30 feet wide. Additionally, bumpouts will be constructed at Walnut Street. Municipal utilities will be replaced/installed throughout the project area.